The V7 27" LED Monitor is designed with style, high screen performance and environmental features for home, work and everything in between, the L27000WHS, utilizes a low power LED backlight and saves on space while giving you a sharp, dazzling view in Full HD at 1920x1080p resolution. With stunning screen appeal, you will have a sharp, detailed, full HD view while surfing the internet, working on projects, editing videos or streaming shows online. High screen performance includes 30,000,000:1 dynamic contrast ratio, 200 nits brightness, 5 ms response time, plus the low power LED backlight helps reduce our environmental footprint. 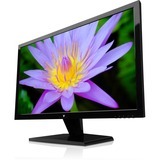 This sleek LED widescreen monitor is a great value and looks sharp on every desktop. With both a VGA and HDMI input you are sure to enjoy the highest resolution possible. The V7 LED monitor comes fully equipped with built-in on-board speakers for the complete audio-video experience.